Does anyone else have trouble with parents missing out on important information because they forget to check the daily folder? I can't be the only one! I know how busy parents are; after all, I have kids of my own. I completely get it! So anything I can do to help parents out, I will. 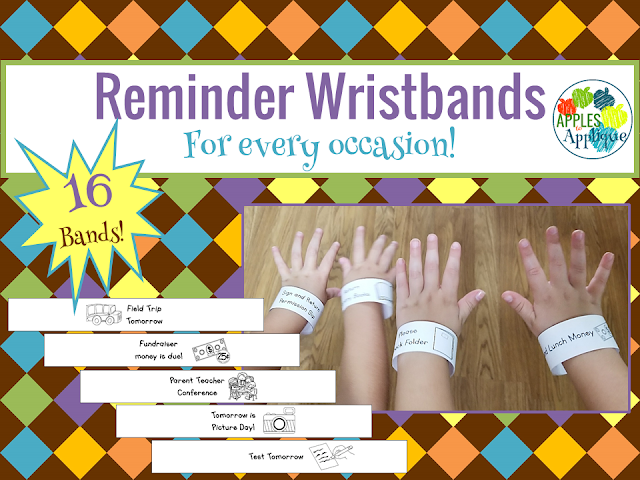 I've started using wristbands to give parents reminders. I had found some cute ones online to use, but they had curved edges to make them shaped like a watch--adorable, but I don't have time to cut out 40 of those for all of my students! So I decided to make my own, which you can find here. With several on a page, they don't use up a lot of paper, and they have straight edges so they can quickly be cut apart using a paper cutter. Less time spent on this kind of stuff = more time teaching. Kids love wearing these wristbands! I had one student last year who wore his for 2 days, because he didn't want to take it off. They are a good visual tool for parents, especially when printed on neon paper (which of course I didn't have on hand when I was taking pictures). A bright wristband on your kid's arm catches your eye much better than a paper in a folder. Here's to keeping on top of all the "little stuff" and improving communication with parents! Disclosure: Some of my posts contain affiliate links. While I receive a small commission for purchases made through these links, I only advertise products I believe in or have personal experience with, and all opinions are my own. Copyright Apples to Applique 2011-2018. Powered by Blogger.